The bookshelf of personal memoirs by those who served in Africa in the years before Independence, particularly if they were District Officers, constantly needs enlarging. Among the most notable titles thus far are Douglas and Marcelle Brown's extensive compendium of particular personal experiences. Looking Back at the Uganda Protectorate, Recollections of District Officers (1996), and Alan Forward's 'You have been allocated Uganda' - Letters from a District Officer (1999) - as if written to an academic friend in Britain from his arrival in 1955 till Independence in 1962. Patrick Walker's Towards Independence in Africa adds significantly to the mix by being shaped as the autobiography of another Uganda District Officer all the way from his birth till Uganda's Independence. Nearly one third is devoted indeed to his up-bringing - born in Malaya in 1932 where since 1914 his father had been an official of the Federated Malay States, till in 1935 the family moved to Kenya on his father becoming Chief Accountant of the Kenya and Uganda Railways and Harbours. There the family lived at No 1 Ngong Road where young Patrick and his always 'white' friends played in an adjacent field still well outside the bounds of the then Nairobi. As was common amongst his kind, he was sent, aged 6, to a local boarding school, then to a British Public School (King's Canterbury), and finally to University (Oxford, Trinity College and a Hockey Blue). He was determined never to go 'abroad', and with his father's support did the rounds of several insurance companies until he realized that 'Insurance' was never going to be his forte. Along with getting married that brought the default position for many 'colonial' children of his kind to the fore. In 1955 he joined the Colonial Administrative Service. His generation did so at a unique moment. With the ending of the Second World War in 1945 they were no longer required to bomb Germany, convoy merchantmen, command artillery. Unlike some of their seniors they knew that sooner rather than later it would all come to an end. But in the meanwhile there were positions open to them which as still young men called to the full on their energies and their liking for adventure. 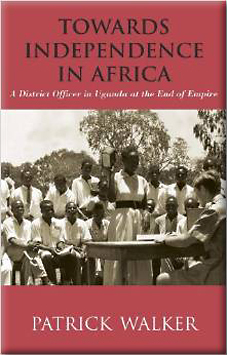 District Officer numbers in Uganda doubled in the 1950s, and along with a multiplicity of technical officials came to constitute what historians have called the 'Second Colonial Invasion'. In his sustained autobiographical format, and especially in much his longest chapter on his first appointment to Teso District - 70 pages in Chapter 7 - Walker gives an especially graphic if familiar account of the melange of involvements which this entailed. Reaching Teso's headquarters, Soroti, he called on the District Commissioner; was soon inducted into the role of an ADC, and among sundry other things given charge of the administration of Soroti township. Over the next two and a half years his routine was punctuated by visits by two successive Governors, a summons to assist in curbing some rioting in neighbouring Tango District, the fruitless chase of some cattle raiders from the adjacent Karamoja District, and the hosing down of a tax revolt in Teso District itself. All the while he was also engaged with his bride in making a home out of a previously condemned house, recruiting servants, learning the intricacies of shopping; and suffering illnesses, not least in their baby son. There were always two highlights. First that stock-in-trade of colonial administration: 'Safari' - touring for several days with a county chief and his subordinates to make all sorts of inspections - most memorably it seems of deep pit latrines; act as the administration's eyes and ears, and push several government policies. Over nine pages Walker spells out the details here in a way which is not always done. And then the second: the Club, which by way of the customary evening drink, many a dance, and all manner of sporting occasions was crucial to the bonding of the District's tiny colonial community. Before leaving Teso Walker eventually fulfilled his ambition to climb the adjacent Soroti Rock, and had his first experience of the local demands posed by a national election and its sign that the colonial era's endgame was on its way. His second posting was to Ankole which unlike Teso had a hereditary ruler; no longer 'actual ruler' but revered even so. Routines were familiar, but there were three variants. Walker was given charge of a resettlement scheme to oversee the replanting of villagers from an overcrowded area into new surroundings. Then with the Congo being plunged in mid 1960 into precipitate independence there was first a flood to be succoured, first of Belgian refugees and then of Tutsis from Rwanda. In the end, however, everything turned on two further national elections, and with the second came Uganda's independence in 1962. With that, new careers needed making. Walker went to MI5; became its Director-General 1988-92, was knighted in 1990, and served as Trustee of the Leonard Cheshire Homes on retirement. Memories of those brief halcyon days remained, however, engrossing as this book once again testifies.